Check out these fun, unique spots to pick out personal gifts for everyone on your list. When you live in Seattle, there’s no need to fight the crowds at a shopping mall for your holiday gift purchasing. Chances are your own neighborhood has fun, unique spots to pick out personal gifts for everyone on your list. No matter what part of the city you are in, you can support local businesses and get your holiday shopping done without even having to get in the car. Everyone knows that Ballard has no shortage of great local restaurants and bars, but the shopping in this neighborhood is just as vibrant. Check out family-owned and -operated Annie’s Art & Frame for tasteful Seattle-themed gifts and a wonderful selection of journals, prints by local artists and artistic cards. Have a kid on your list? Clover Toys carries traditional toys, books, costumes and games and is owned by two local women. Horseshoe is a great destination for unique, Western-themed women’s apparel and jewelry. For well-made, reasonably priced housewares, furniture, art and a beautifully curated selection of gifts, head to Camelion Design. For shopping as diverse and lively as the neighborhood itself, be sure to check out the hidden gems of Capitol Hill. If you have a technical mind to shop for this holiday season, make sure you stop in Ada’s Technical Books and Café. Not only can you use it as a caffeine break during your shopping day, you can browse through a huge collection of science- and technology-themed books, as well as cool jewelry, puzzles, games and kits. For a shopping experience that feels like a museum visit, find your way to Ghost Gallery’s new home in Chophouse Row. The gallery, curated by owner Laurie Kearney, hosts art exhibitions and jewelry and gift sales. For the person on your list who’s always looking for new trends in design or in the kitchen, you may find just the thing at Stock & Pantry. Check out this fun shop for an artisanal jam, specialty spice or modern ceramic bowl. 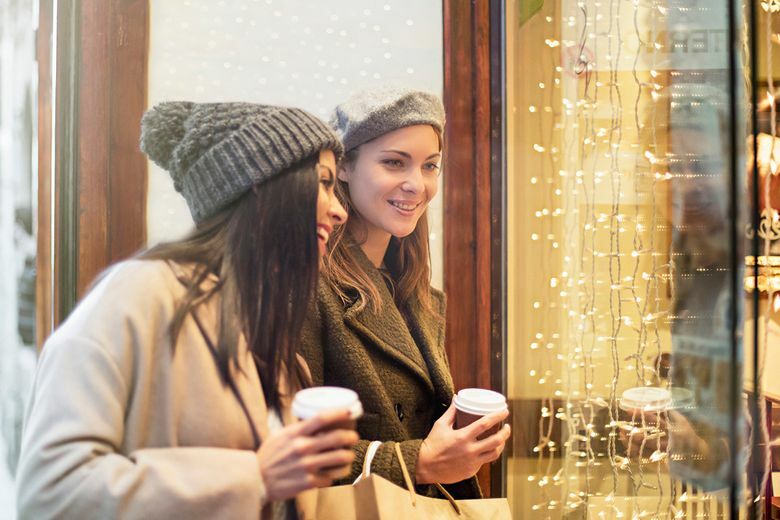 OK, so shopping downtown might not get you away from the crowds, but Pike Place Market and the surrounding area can be magical around the holidays and chock-full of delightful shopping finds. If you want to start out at the Market, you’ll certainly be curious when you pass Seattle-based artist La Ru’s shop, Robot vs. Sloth. Shirts, prints, pins, patches and stickers all feature La Ru’s whimsical illustrations of animals and robots doing cute things, plus discover some pieces by other local artists. Stick in the Market to find the stunning Watson Kennedy Fine Living, which has been packed with European-style gifts for the home, body and bath, all curated by Ted Kennedy Watson since 1998. For the paper lover in your life, don’t miss Paper Hammer, the flagship retail store where you can find hand-bound journals, albums and letterpress goods all made in the company’s Tieton, Washington studio. The tight-knit community knows how to shop local, so gift-shopping options abound here. If you live in West Seattle, you can get your holiday shopping done without even crossing the bridge. For the person in your life with a green thumb who appreciates the details, step into the beautiful Fleurt Collective, a boutique featuring plants, jewelry, and artisanal candles, perfumes and lotions. Looking for a unique accessory, bag, wallet, belt or pair of glasses? Don’t miss Click! Design That Fits, which carries a unique collection of clothing, accessories and home goods that will surely fill up an afternoon and cross several people off your shopping list. To add some art to your shopping day, make sure to stop at Virago Gallery, where art and jewelry exhibitions feature the work of different women and LGBTQ artists and designers throughout the year. You may know that the ID is the place to go for a good bowl of pho, or the best dim sum, but this traditionally Asian-American neighborhood also offers a shopping experience unlike any other you’ll find in the city. The owners of Momo, in Japantown, handpick every piece of clothing (they carry men’s and women’s) as well as a gorgeous collection of body and home goods sourced from all over the world, including Japan, Korea, Seattle and Hawaii. You probably stop by Uwajimaya for all your specialty Asian grocery shopping needs, but don’t forget about their extensive gifts section to pick up a genuine rice cooker, set of specialty chopsticks or an origami or calligraphy set. Have a tea lover in your life? Make time to stop in at New Century Tea Gallery, where you can enjoy a free tea tasting while you shop the selection of specialty teas that can be wrapped up beautifully.